The Promate primeShield.Air is an ultra-tough high density tempered glass screen protector for iPad Air. primeShield.Air is constructed using an innovative scratch resistant tempered glass material which is five times stronger than regular glass and can resist scratches even from knives and keys. The rounded edges offer a more precise fit to your iPad Air. The self-absorbed adhesive side of primeShield.Air is coated with an anti-shatter silicon film that ensures protection to your device even if the glass shatters and also assists in easy installation of the screen protector. This screen protector is 0.4mm thick coupled with an oleophobic coating that provides premium protection from smudges and fingerprints with no loss in touch screen sensitivity. primeShield.Air is made of an optical graded PET film that enhances colour and provides a sharper view. The optical graded PET film has a higher light transmittance than normal grade PET film and thus provides protection from eye fatigue due to extensive and continuous use of your iPad Air. The Promate primeShield.Air is an obvious choice when it comes to optimum screen protection. •The surface has a hardness of 8-9H, five times stronger than regular glass. 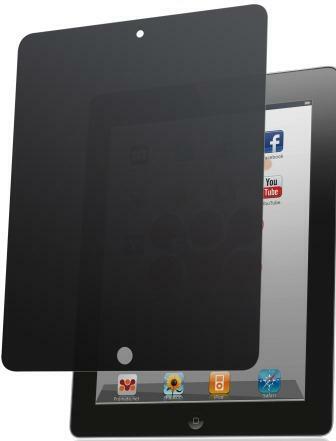 The Promate privMate.iPA Premium Privacy Screen Protector for iPad is a screen protector that allows you to use your iPad in complete privacy. Specially tinted plastic allows you and only you to see your screen, and tilting the phone even slightly renders the display invisible, perfect for stopping people from looking over your shoulder. The privMate.iPA offers long-term premium screen protection against dust, marks, smudges and scratches and allows for superior touch-screen sensitivity and anti-glare features. Complete with cleaning cloth and installation card, the privMate.iPA is simple to attach and easily removed, leaving no residue behind and without interfering with touch screen responsiveness. The Promate primeShield.Air is an ultra-tough high density tempered glass screen protector for iPad Air. primeShield.Air is constructed using an innovative scratch resistant tempered glass material which is five times stronger than regular glass and can resist scratches even from knives and keys. The rounded edges offer a more precise fit to your iPad Air. The self-absorbed adhesive side of primeShield.Air is coated with an anti-shatter silicon film that ensures protection to your device even if the glass shatters and also assists in easy installation of the screen protector. This screen protector is 0.4mm thick coupled with an oleophobic coating that provides premium protection from smudges and fingerprints with no loss in touch screen sensitivity. primeShield.Air is made of an optical graded PET film that enhances colour and provides a sharper view. The optical graded PET film has a higher light transmittance than normal grade PET film and thus provides protection from eye fatigue due to extensive and continuous use of your iPad Air. Promate primeShield.Air is an obvious choice when it comes to optimum screen protection. The Promate proShield.Air-C is a clear screen protector that gives your iPad long-term premium screen protection against dust, marks, smudges and scratches. The screen finish allows superior touch-screen sensitivity and anti-glare features. Complete with cleaning cloth and installation card, the proShield.Air-C is easy to attach and remove, leaving no residue behind and without interfering with touch screen responsiveness. •1.Clean your iPad screen from dust, smudges using the cleaning cloth. •2.Pull the red tab marked Back and separate the protective file off the guard. •3.Gently apply the film to the screen of iPad starting from the bottom to align the button and work the way up the screen. •4.Gently scrape the installation card to squeeze out the bubbles. •5.When finish applying pull the black tab marked Front of.